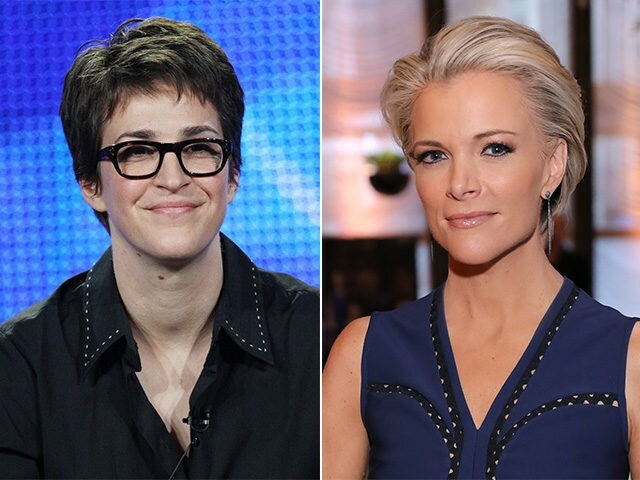 MSNBC’s The Rachel Maddow Show virtually tied Fox News’ Kelly File in the key 25-54 demographic on Wednesday, the third time this month in which Maddow has tied or beaten Megyn Kelly’s show in the all-important demo as MSNBC viewership has risen steadily through the summer. While Megyn Kelly is on vacation from hosting duties, Kelly’s 9 p.m. primetime show drew 401,000 viewers in the demo Wednesday night, and Maddow’s MSNBC show drew 400,000, according to Adweek‘s Scoreboard. Maddow also beat Kelly File in the demo on Monday, August 15 (428-416) and on Thursday, August 4 (493-485). Kelly File led in total viewers on each of those three nights, by roughly 500,000 viewers. But it’s that 25-54 demo sweet spot that advertisers really covet. This week’s ratings break a trend set during previous absences by the Fox host. On August 20 of last year, while Kelly was on vacation and Maddow was on, Kelly File dominated the Rachel Maddow Show, pulling in 453,000 viewers in the demo to MSNBC’s 174,000. On March 23, when Kelly was again absent and Maddow was on, Kelly File drew 505,000 viewers in the demo to Maddow’s 380,000. Fox News is still the most-watched cable news network, but MSNBC has enjoyed a significant bump this summer. The network’s primetime lineup beat CNN in both total viewers and the key demo to land at No. 2 overall in the second quarter of this year, and Maddow’s 9 p.m. show also beat CNN in both total viewers and in the demo. July marked the 38th straight month that Maddow has beaten CNN in total viewers. In fact, according to Adweek, July marked MSNBC’s most-watched month in nearly four years, with triple digit surges in both total viewers and the demo over July 2015. And it wasn’t just Maddow’s show outperforming expectations; All in with Chris Hayes and The Last Word with Lawrence O’Donnell also saw big gains over last year. The network also outstripped both Fox News and CNN during its coverage of the Democratic National Conventions last month. This post has been updated to include past data on the two program’s ratings for comparison.